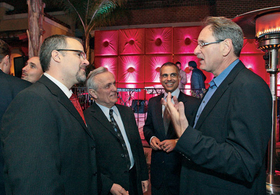 At Audi's NADA reception, Audi of America President Johan de Nysschen, right, chats with Dean Buschick, general manager of Roger Beasley Audi in Austin, Texas, left; Eitel Dahm of Audi of Rochester Hills in Rochester Hills, Mich., second from left; and Mark Del Rosso, Audi of America COO. • Profits are more important than 200,000 U.S. sales goal. • Q5 hybrid coming in late 2011. • Production for the U.S. to grow 10% this year. ORLANDO -- Despite Audi's oft-stated plans to sell 200,000 vehicles in the United States by 2018, the luxury brand's North American chief says profitable growth is more important. "We are not going to chase volume for the sake of volume," Johan de Nysschen, president of Audi of America, said at the U.S. National Automobile Dealers Association Convention this month. "We will only grow if it puts an extra dollar in the bank. Otherwise it is no good." De Nysschen said he expects Audi's U.S. sales to increase this year, probably to just over 90,000 vehicles. Audi AG CEO Rupert Stadler established the 200,000 goal for the company's North America unit. In 2009, Audi sold 82,716 vehicles in the United States. To feed growth and bolster thin inventory, Audi will increase production for North America by 10 percent, de Nysschen said. Today's supply is at 38 days vs. a goal of 60 days. The supply should begin to increase in late April as the extra production arrives. De Nysschen said Audi should be back at a 60-day supply in May or June. He also confirmed that Audi will introduce a gasoline-electric hybrid version of the Q5 crossover in late 2011. U.S. production of Audi vehicles is not imminent, de Nysschen said. The brand needs to build volume before it commits to North American production, particularly to justify its own plant, he said. "You need to build about 100,000 copies of a car," de Nysschen said. Audi's highest-volume nameplate is the A4 car, which sold 37,070 units in 2009. Audi is first considering ways to generate North American content. One strategy could be establishing an engine and transmission plant here and shipping the powertrains to Europe for assembly plants there, he said. Audi dealers would like to see the brand get into additional segments in this market. They've asked about a car smaller than the A3. But de Nysschen said the smaller A1, already sold in Europe, is too small for the United States. He said Audi will improve the fuel efficiency of its U.S. fleet by outfitting existing U.S. vehicles with additional powertrain options. Jack Hanania, chairman of the Audi National Dealer Council, is optimistic. "If we continue to grow our market share, I think Audi will continue to deliver some more products," said Hanania, who owns Audi, Acura, Volkswagen and Hyundai stores in Jackson-ville, Fla.
-- Exclusive stores posted a 2.5 percent return on sales in 2009. That marked a rebound after slipping as low as 1 percent, de Nysschen said. -- It will work with the dealer council this year to renew its dealership margin and bonus plan for 2011 and beyond. Dealers should get details in the fourth quarter. The current bonus system expires this year.